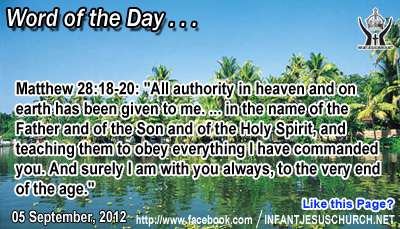 Matthew 28:18-20: "All authority in heaven and on earth has been given to me. Therefore go and make disciples of all nations, baptizing them in the name of the Father and of the Son and of the Holy Spirit, and teaching them to obey everything I have commanded you. And surely I am with you always, to the very end of the age." Heavenly Father, from whom all peoples get their hope, use your Spirit to rouse within us a passion to share your grace with others. Help us get out of our safety zone and call us into your authorizing and sacrificial grace so that we can help others come to know you. In the saving name of Infant Jesus we pray. Amen. When Simon Peter invited Jesus to his home for the Sabbath meal, Peter’s mother-in-law was instantly healed since Jesus heard Simon's prayer. Jesus could not keep away from drawing a crowd everywhere he gone. No one who asked Jesus for help was left dissatisfied. Jesus' numerous healings and exorcisms established the power and authority of his word, the "good news of the kingdom of God. Jesus put human need ahead of all else. His compassion showed the depths of God's love and concern for all who are truly deprived. Jesus gave the people the word of God and he healed them physically as well as spiritually. We can never impose upon God nor weaken his generosity and kindness. He is ever ready to give to those who earnestly seek him out. Do we allow Jesus to be the Lord and Healer in your individual life, family, and community? Approach him with hopeful faith. God's healing power restores us not only to health but to energetic service and care of others. There is no trouble he does not want to help us with and there is no oppression he can't set us free from. Do we take our troubles to him with hopeful faith that he will help us?